The weather here has decided to start looking like Spring again, just in time for the 2nd release of my Haiku Collection. Haiku Garden contains the green that is starting to appear, as well as the butterflies that will make there appearance a little later in the season. Ok, butterflies won't really be here until the Summer...but play along with me, here! 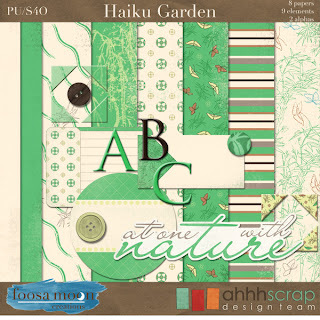 This kit contains 2 solid papers, 6 patterned papers, 3 buttons, 3 tags, 2 photo corner sets, 1 word art in sticker and rub on format, and 2 alphas. These pieces are designed to stand alone, or coordinate with Haiku Blossom (and the third Haiku set coming out on Monday)! I'm taking some time off again this weekend to spend time with family. My mother-in-law and sister-in-law are visiting from out of state, so we will be having lots of quality time while we can! That being said, I will still be back in your inbox on Monday with the 3rd Haiku release. When I started working with Haiku, Blossom was the set I worked first and thought would be my favorite. In the end, the 3rd set is my favorite of the 3, if I'm going to play favorites!